Are you thinking about changing or replacing your life insurance policy? For many individuals, life insurance is not a set it and forget it purchase. There are a variety of reasons why changing or replacing your policy makes sense. However, replacing life insurance may or may not be a good idea and will depend on certain situations. There are pros and cons to replacing life insurance policies. You’ll also want to know all of the life insurance replacement regulations and rules . Today we’re going to answer these and other frequently asked questions about life insurance replacement. Hopefully this article will help you decide if replacing you policy is a good idea. What is the definition of a life insurance replacement? A life insurance replacement is when you discontinue your current in force life insurance policy in order to buy another. There is a pretty fine line that you need to be aware of between life insurance replacement (permitted) and life insurance twisting (prohibited). What is twisting and how is it different than a life insurance replacement? The definition of insurance twisting is when an agent tries to persuade a life insurance policy owner to replace their current policy with a new policy through misrepresentation. Twisting insurance is very similar to Churning as it occurs solely for the agent’s benefit of earning a commission. Each state has laws that will determine the actual meaning of “replacement”. The meaning of replacement can vary dramatically from state to state. If you’d like to find your state’s insurance code and their life insurance replacement regulations, then you should begin by visiting the National Association of Insurance Commissioners website. Simply find your state and their insurance department. Why would I want to replace my life insurance? Many people buy a life insurance policy one time and think they’re set for life. For some, it actually is a one time purchase. However, there are many reasons where replacing life insurance makes total sense. Let’s look into the pros and cons of replacing life insurance. The cost of life insurance can be a major factor in replacing life insurance. Perhaps you purchased a life insurance policy in the past that costs way more than what you could actually get. There are hundreds of life insurance companies to choose from. You may have purchased a policy from an agent that only represented 1 company. Depending on your specific situation, you may have qualified for the same coverage amount at a much lower cost. It’s recommended that you review your life insurance needs 1 a year or every few years as life events often change financial goals. Perhaps you’ve purchased a home or gotten married. Maybe you’ve added to your family and had a child. Perhaps you’re approaching retirement or have recently retired. Each of these life events may significantly alter your coverage needs where insurance replacement may be appropriate. Perhaps you were approved and received a more expensive rating with your first life insurance policy. People are often approved at a more expensive rate due to a risky health condition, tobacco use, or even being a little overweight. Have you improved your health? Did you quit smoking or stop using tobacco? Did you lose some weight? Each of these situations may warrant replacement of life insurance if your current company won’t adjust your premium. An insurance policy replacement with a new carrier may save you considerable amounts of money. Your coverage needs are unique and the type of life insurance you initially bought may no longer meet those needs. Your first life insurance policy may have been perfect 10 or 20 years ago. Perhaps you 10 year term initially, but now you need lifetime coverage like whole life insurance. Maybe the opposite has occurred- you bought a lifetime policy like universal life, but no longer need long term coverage. For example, perhaps you only need a 20 year term now to cover you until retirement. Sometimes people get into situations where the owner runs into scenario that calls for insurance replacements. If you are recently divorced, and your ex-spouse claims full or partial ownership, a life insurance replacement might be needed. This situation can play itself out in business too. A business partner may cause a replacement if they claim partial or full ownership of the policy. The Life Insurance Marketing and Research Association (LIMRA) surveyed life insurance owners about replacing their policies. Let’s look at the results and the most popular reasons why. Multiple responses were permitted. I wanted to switch to term insurance, the kind that only provides coverage without building cash value. While my needs hadn't really changed, I became convinced that I was underinsured. I could afford more, so I bought more. I found a new agent whom I liked. I wanted to consolidate several policies into one. I found a new company that I liked. I wanted to switch to the kind of policy that builds cash value. I thought that I would get the same or more coverage at a cheaper rate. *Source: Life Insurance Marketing and Research Association (LIMRA) “Replacement Now,” 4/17/85, Page 5. When you purchase a new policy, a new life insurance contestability period begins. This means that on average, a new 2 year waiting period begins for the policy’s suicide clause or other causes of death where insurer may challenge the death benefit. Your existing life insurance policy may have some great policy provisions that the new policy may lack. For example, maybe your original policy had a better guaranteed interest rate on policy cash value loans. Perhaps your old policy included some life insurance riders that you would have to pay extra for with the new policy. You will be subjected to new 1st year expense charges when you replace a life insurance policy. These first year charges are things such as underwriting, agent commission, and issuing the new life insurance policy. It’s more than likely that a new life insurance policy will be more expensive if your health has deteriorated or some other risk has occurred. If your health has worsened since you bought your original policy, you can expect a higher rate. Have you gained weight? Did you start taking any medications or use tobacco? These are all common situations that may make replacing life insurance a bad idea. Do you have a whole, variable or universal life insurance policy? A policy with cash value? You shouldn’t replace if your existing life insurance policy can’t qualify for the Section 1035 tax free exchange of the Internal Revenue Code. An example would be if you had an outstanding policy loan, it could be hard to affect the tax-free exchange. You don’t want to have any issues with the IRS when tax season rolls around. You want your cash value to stay tax exempt. In order for you to accomplish this, you’ll need to transfer ownership of the original policy to the replacement policy. This is the “exchange”. This is very important to understand and you run the risk of losing some cash value from your original policy if done incorrectly. How do I replace my life insurance policy? Now you know the advantages and disadvantages of replacing life insurance. If you’re ready to move forward and replace your original policy- there are a few steps you need to take. Use an independent life insurance broker like Life Insurance Blog. They’ll be able to shop your life insurance policy from multiple carriers and find the best deal that you can qualify for. During the application process, you’ll be asked if you’re going to replace an existing life insurance policy. Don’t be concerned or worried that this will cause any problems. The life insurance industry wants to protect you and other consumer from unethical agents who are using insurance twisting and churning. Make sure you are approved and have your new life insurance policy in force before you cancel your original policy. This will also give you a little time to review the new policy and be certain that it meets your goals. Now that you have replaced your old life insurance policy, how do you cancel it? Here are some ways to officially terminate your old policy. 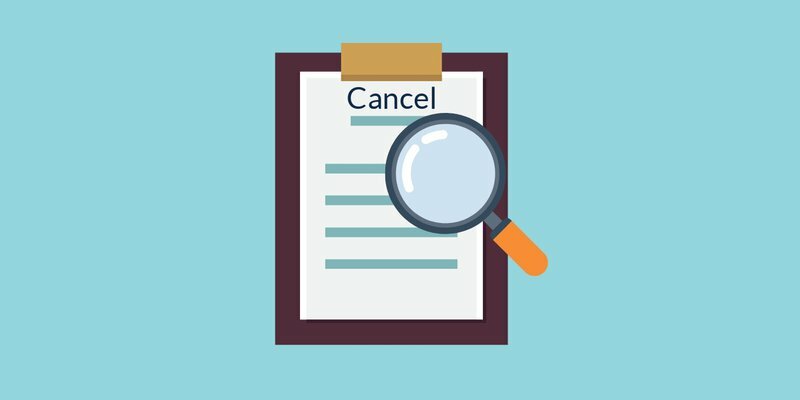 Stop Paying: If you’re ready to cancel your policy immediately, simply stop paying for it. Your policy will no longer be active and will lapse when you stop paying the premiums. You will have an additional 30 days that allows you to reinstate your policy. This is called the 30 day grace period and allows you to save your policy if it’s within those 30 days. Let it Ride: Are you toward the end of your term? You can keep your old policy and pay for it until it lapses. I personally did this when my 20 year term policy was at year 19. The premiums were so low on my $500,000 policy that it made sense to keep it for another year until it lapsed. It was paid via EFT and I simply left it alone until the end of the policy. Life Insurance Replacement Form: You may also send in a life insurance replacement form to your original life insurance company. The replacement form will inform the carrier that you’ll be changing from the old policy to the new policy. No matter what the reason is for your life insurance replacement, it is always best to compare all of your options before making a decision. Always use an independent life insurance broker like Life Insurance Blog that will help you find the carriers who can offer you the best deal. Simply reach out to us to see if it makes sense to replace your policy by calling 888-411-1329. You can also use our free instant life insurance calculator on this page or read more about insurance by visiting our Life Insurance 101 page.